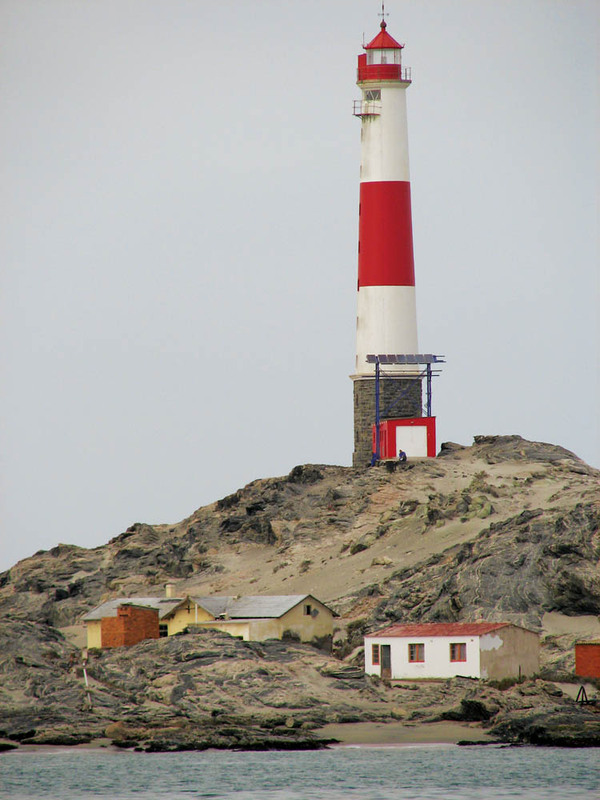 Lüderitz – the rough calloused hands of the town hold the sparkling blue bay, often gnashed by an unruly south-west wind. Colourful fishing and diamond boats bob on the waters of the harbour, fish factories line the shore, and the town stretches into the rocky hills, with Felsenkirche, the 1912 rock church, perched on a hill like a tall, thin bird with multicoloured stained-glass eyes. The harbour extends out to Shark Island, and then rounds the corner into the larger bay. Further west, Dias Cross, the lighthouse and a handful of Cape fur seals cling to the rocky promontory thrashed by icy waves, and Halifax Island’s colony of African penguins bathe in its shallows as the coast runs south towards the Sperrgebiet, once forbidden diamond territory, and the 55-metre high Bogenfels rock arch. Bartholomeu Dias, the renowned Portuguese explorer, planted his padrão or cross on this barren, rocky coastline on 24 July 1488. Angra Pequeña, ‘little bay’, lay undisturbed for hundreds of years, save for indigenous Khoisan people who travelled through the area and, in the 1800s, whalers, sealers and trading vessels that visited the desert coast. In 1883, Heinrich Vogelsang, acting on behalf of German merchant Adolf Lüderitz, bought the piece of land surrounding from Nama chief, Joseph Frederiks. The deal was conducted in German geographical miles, which are more than five times longer than English miles, a fact unbeknown to Frederiks. Although Adolf Lüderitz soon disappeared into a watery grave in the coastal waters off the Orange River mouth and Angra Pequeña, the settlement expanded as the fledgling German colony spread its wings. With no source of fresh water, it was dependent on water from its condenser and a supply that was transported by ship from the Cape. The sleepy settlement became an important supply post for the Schutztruppe, the German protection troops in the 1904 Nama war against the German colonial forces, and a railway line was constructed into the interior in 1906. With the completion of the railway and the signing of the peace treaty, railway builders were retrenched and thousands of soldiers returned homeward to Germany, leaving the settlement to the buffeting winds that blew in from the Atlantic Ocean and the sands of the Namib Desert. It was not surprising that the townfolk had difficulty believing that their desolate desert sparkled with diamonds when railway worker Zacharias Lewala spotted a shining stone while shovelling sand off the tracks between the railway sidings outside Lüderitzbucht (Lüderitz Bay) in 1908. Hopeful prospectors flocked to this corner of the country, caught up in the diamond frenzy. Elaborate houses were built in the prevailing German architectural style, the hotels prospered and champagne flowed in the well-attended bars. People dressed in their European finery paraded in the streets, visited the theatre, horse races, skittle alley and Karneval as diamond wealth shimmered through the town. The waters of the Atlantic Ocean fed by the cold Benguela Current held riches of their own, and a lucrative crayfish and fishing industry was established in Lüderitz. Today, a row of abandoned fish-factory warehouses add to a nostalgic atmosphere that pervades the place, making it a fitting base from which to explore the surrounding ghost towns, with brightly painted houses maintaining a balance. Locals have dipped into their paint pots, boldly painting their century-old German houses in primary shades, adding brilliance and colour to the bleak desert landscape. 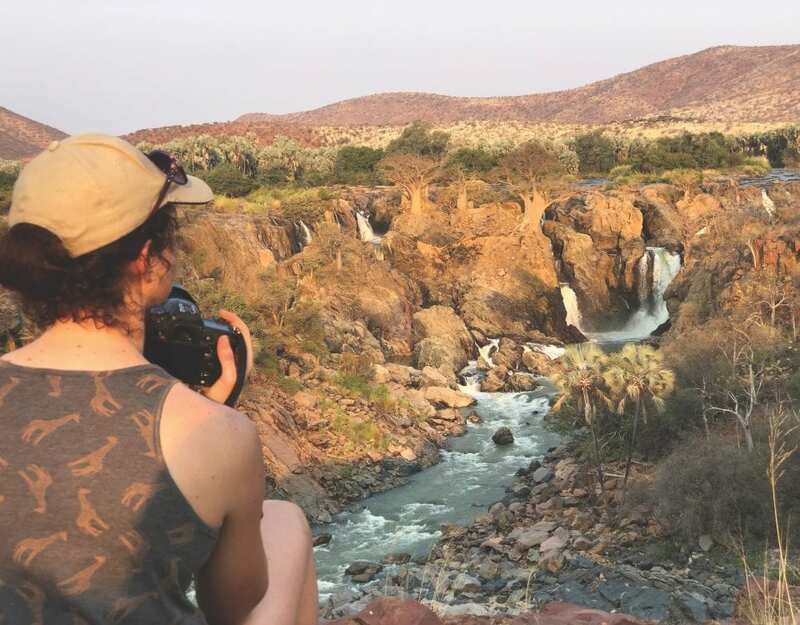 There is much to be discovered in Lüderitz and surroundings, especially if you have an interest in diamond history or out-of-the-ordinary places. This unique blend of history and desert characterise the town. You can stroll to the museum in Dias Street, walk along Bismarck Street up to the well-preserved Goerkehaus, and up Diamantberg Street to the Felsenkirche from where you have an unsurpassed view of the town. You can shop for a typical Oshiwambo basket and have the latest African hairdo at the waterfront. The population of Lüderitz includes many Oshiwambo-speaking people from the north of the country who provide a large proportion of the workforce for the mining and fishing industry in the area, contributing their African air to the old German town. 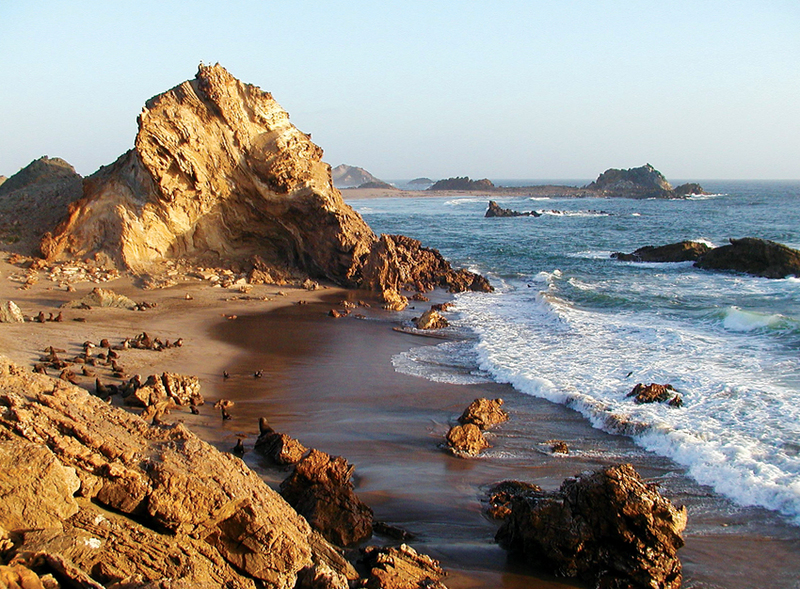 Recommended drives around Lüderitz include visiting Agate Beach and Dias Point for coffee and cake. The Shearwater Oyster Factory offers guided tours through its processing plant, giving visitors a taste of the fresh, distinctive Lüderitz oysters. The bay is worth exploring on a morning boat trip before the wind whips up, either on a schooner or slightly sturdier catamaran, to give you an understanding of the layout of the area with its many bays and promontories, to breathe in huge lungfuls of Atlantic air and to enjoy the sea creatures that live in the chilly waters, such as a Heaviside’s dolphin skimming the water beside you, penguins and seals, and if extremely lucky, a spurt from a visiting whale. Shorter sunset cruises circle the nearby islands and complete the good Lüderitz day. A highlight of the visit to Lüderitz is the old diamond-mining town of Kolmanskop on the outskirts of the town. 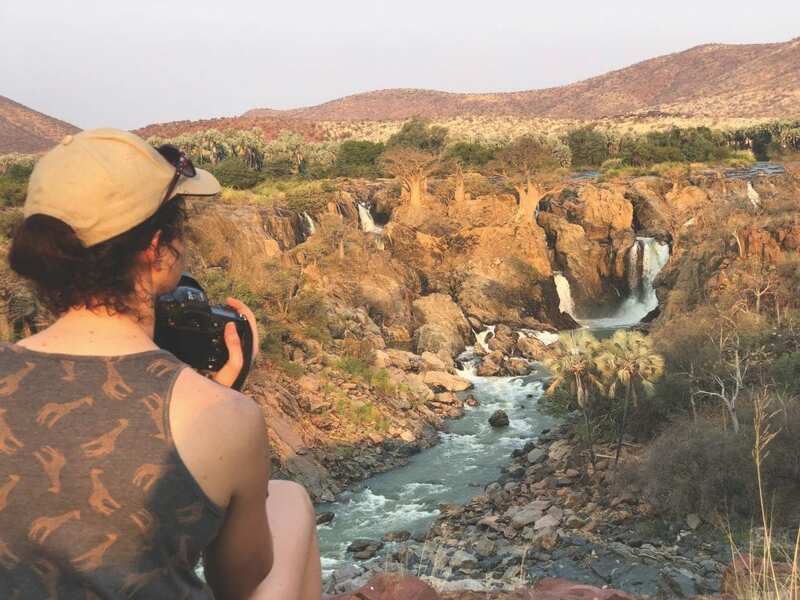 Day trips into the Sperrgebiet are also offered, taking you around the ghost towns where old diamond tumblers and rusting beds litter the sand, and skittle alleys remind you of the hey-day of this part of the Namib Desert when diamonds could be picked up by the light of the moon. Diamond intrigue, colourful stories, and the nature of a coastal town in the middle of the desert make a journey to Lüderitz most worthwhile. The small town built on rocky hills holds more than the bay in its weather-beaten hands. It holds perseverance, dreams materialised, war stories, the rollercoaster ride of Life, the change of fortunes, the humble and hard work of the mining and fishing industry, survival in the desert against all odds, the inevitability of change… and the rich and surprising history that began with a chance diamond find in a desolate desert, one innocent day in 1908. This article appeared in the January Edition of FLAMINGO Magazine.